Louisiana Conference: First UMC takes to streets with "Got Ashes?" 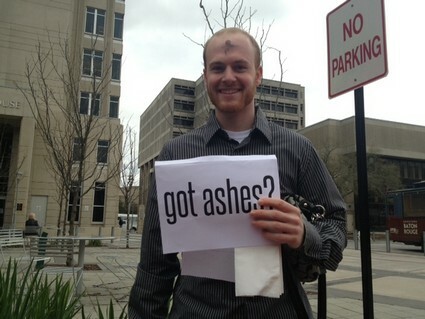 First UMC takes to streets with "Got Ashes?" Spearheaded by First United Methodist Church and the LSU Wesley Foundation, the imposition of ashes last Wednesday became an evangelical experiment when both groups “took to the streets” of Baton Rouge with this important Lenten ritual. McKay Simpson worked with Rev. Susie Thomas, also an associate pastor for First UMC, and Rev. Drew Sutton, campus minister for the LSU Wesley Foundation, to organize the outreach event.